The Kitchn offers instructions for cleaning enameled cast iron grates. Before soaking them with hot water and soap, they pour boiling water over the (perfectly cool) grates in the sink to cut the grease. After the boiling water trick and the soap soak, a scrubbing with Bon Ami (a mild abrasive cleanser) finishes the job. 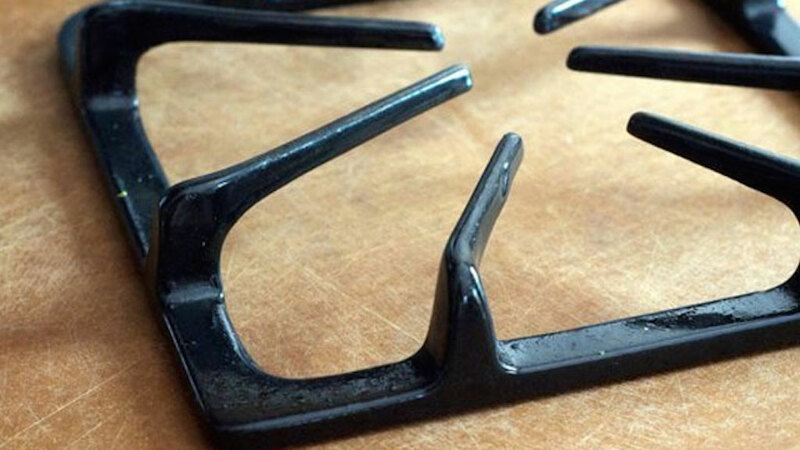 If your cast iron grates aren’t enameled, you shouldn’t do the soaking part, but the pour of boiling water could still help. Check out The Kitchn’s post for the full tutorial.